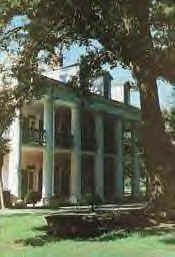 What better place to film a movie about creatures that walk the night than Oak Alley Plantation in Vacherie, Louisiana? Seen in numerous films including, “Interview with a Vampire,” the plantation has it’s own way of making visitors feel welcome. A canopy of tall oaks shield visitors from sunlight as it frames the main house, its soft pink walls beckon to you relax under the formidable veranda. Is it no wonder that the original family was loathe to leave it? Employees at the plantation are regularly visited by the supernatural. Lights turn off and on during tours, touches as they walk by certain rooms, the smell of lavender wafts through the room of the original lady of the house along with the presence of a shadow just out of the corner of the eye. Phantom carriages have been heard riding up a gravel road, the clip-clop of hooves resounding in the stillness that sometimes accompanies the sound. A child weeps, it’s plaintive misery being carried through time and echoes in the empty mansion. Recently, a candlestick flew across a room while a tour was being conducted. Visions of a violent and deadly struggle accompanied one woman while on tour, she watched as two men of the house wrestled with a Confederate soldier. The soldier is pushed from a second floor balcony, his body was then dragged to the river and rolled in. Later, a houseguest reported intense back pain while on the veranda. As he moved away, the pain lessened but returned if he ventured back to the spot. He was so amazed by the experience that he shared it with his hostess who then revealed that that was the area in which the scuffle in the vision had taken place. Clocks hold a time all their own at Oak Valley. In an old southern custom, the clocks are stopped at the exact moment of the last owner’s death (in this case, 7:30am). The clocks were not touched again since. Recently, several guides have found that many of the clocks were set to different hours around the house. Did they reflect the death of other family members or do they follow the mysterious ticking of a clock only heard but never seen in the mansion?